BUFFALO, N.Y. -- The Herd was bested by the RailRiders, 6-2, from Coca-Cola Field Monday night. Scranton/Wilkes-Barre put together a four-run frame in the third that was a major factor in dealing a loss to Buffalo. In the big third inning, Scranton/Wilkes-Barre collected four hits and all the runs came with two outs. A ground rule double from Tyler Wade put two runners in scoring position for Clint Frazier, who chopped a slow ground ball and arrived safely at first base for an RBI. A seeing-eye single from Ryan McBroom extended the early lead to two runs. Then, Bruce Caldwell's double to the right-field corner plated two more runs. The RailRiders added to their lead on solo home runs from Frazier in the fifth and Caldwell in the eighth. The Bisons faced the Yankees No. 2 prospect, Justus Sheffield, who got the start for the RailRiders. 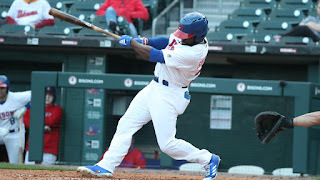 Buffalo had difficulty at the plate against the southpaw and they were only able to scratch across one run on three hits in the seven innings Sheffield pitched. The Bisons produced a run in the third when the Herd had some two-out life. Roemon Fields and Anthony Alford both reached base and Dwight Smith Jr. knocked in Fields on an RBI-single that just squeaked past the infield. In their last chance at the plate, the Bisons were able to come up with a run. Buffalo, down to its final out, got an RBI-single from Reese McGuire that brought home Jason Leblebijian.